Facebook is the world’s most favored and popular social network for a reason; the web application-plus-social platform has evolved so much over time, that if you were to put its earlier editions next to the current shape and look of the website, you would barely be able to make any connection (except maybe the familiar blues). From the photo sharing experience to availability (and playability) of the games, the groups and assorted communications, the improved messaging interface and the integrated video calling, along with almost everything else, has improved by leaps and bounds over time. However, that doesn’t imply that all areas of Facebook are an absolute delight, and one of the worse examples comes in the form of Facebook Chat. To be quite honest, Facebook Chat has always been more of a problem for me than being a convenience. For one, there will hardly be anyone who’d deny that it isn’t really the ideal instant messaging client, and not even by a long shot. It offers basic communication ability, and while I completely agree that the integrated Skype service for video calling is a fantastic addition, I’d still take Google+’s hangout over a Facebook video call any day, just because the former looks and feels loads better. Then, there’s another aspect, too; I have some friends who’d constantly complain that I don’t reply to their messages on Facebook. The thing that they fail to understand is that the chat service would show me always as ‘online’ because although my iPhone is configured to sync Facebook Messenger, that doesn’t mean I am online and checking the service 24/7. On top of that, Facebook’s “Seen” and “Read” messages are becoming even more frustrating. Thankfully, there’s an easy fix to all of this, but one that I didn’t about until today. 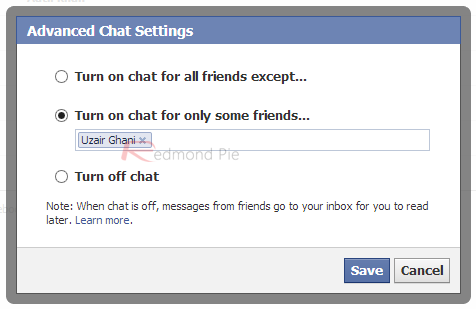 Facebook allows you to now appear online on chat to only a select list of people, while appearing offline to everyone else. 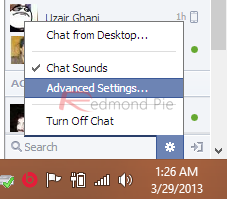 The setting is enforced using Facebook’s web chat panel, where you’ll need to click the configuration wheel at the bottom of the panel and go to Advanced Settings. Within the Advanced Settings dialog, you have three basic settings, viz. blacklist a few people from your friends while keeping chat on as a general setting, turning chat on for only a few people while keeping others offline, or turning chat off altogether. Depending on which option you select, you’ll add the names of your friends to either block them, or allow them in the whitelist. I am not entirely sure when Facebook introduced this service, but it’s a really fantastic addition that would settle the woes for a lot of people. If you have been unaware like me, make sure you check it out; you may never guess how many tough spots such selective visibility can get you out of.